First, let me wish all of you a very Happy New Year! It has been another excellent year here at Data Recovery Services and a lot of the credit goes to our wonderful Partners. We have been working on new programs and promotions for 2013 which we be announcing to you very soon. One event I can tell you about is a meeting of the local Dallas Partners on January 17, here at our Corporate Headquarters. There will be presentations on "Selling Recovery Services" as well as live demonstrations in one of our clean rooms. We plan on recording the sessions and making them available to all of our Partners nationwide. Our goal for 2013 is to significantly increase the revenue we get from our Partner network. Therefore, we will be working with you very closely over the coming year to help you drive more business to your websites and storefronts. Thank you again for a great 2012 and I look forward to working with all of you in 2013! Based on the great success of our trip to Round Rock in September, ACE Data Recovery visited with Dell at their Global Command Centers in Oklahoma City, OK and Nashville, TN. ACE Data Recovery are one of only 3 vendors in the United States that Dell recommends for their customers' data recovery issues. In October, ACE Data Recovery met with support agents in Oklahoma City and spoke about how they can best help Dell customers with their recovery challenges. In November, ACE Data Recovery travelled to Nashville to visit with the local support agents. ACE Data Recovery General Manager, Don Wells, provided the Dell agents at both locations a unique opportunity to see some of the custom designed and built hardware and software used to solve complex customer issues. A drawing was held during the visits at both facilities and several Dell employees went home with a various gift cards and other prizes. ACE Data Recovery plans to repeat these visits every quarter to all the Dell Global Command Centers in the United States. 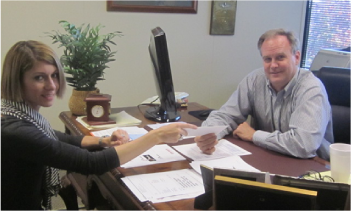 Data Recovery Services Partner Manager, Tatiana Platonova presents monthly commission check to Hap Burden of Happy Computer in Plano, TX. Hap is one of the oldest and most valued active Referral Partners with Data Recovery Services. He has been constantly sending us clients since 2005. Given the availability of backup tools such as those used either on-site or in the cloud, most people feel they are completely protected in the event of data loss. Those using RAID devices, whether it is a RAID 1 or RAID 5 configuration, can have an equally false hope that they are covered for all potential data recovery scenarios. The reality is that logical and physical media failure can significantly affect all of the aforementioned cases. Unfortunately when unexpected failures occur people often make the situation worse by trying potential remedies they found on the internet. In most instances the best remedy is to do NOTHING. We are here to help our valued Partners when your customers come to you with media damage. Our experts will work with you to determine the exact cause of the failure and what your customers need to do next. Come Visit Us at our Dallas Headquarters on January 17, 2013, for a day dedicated to our partnership with you, including a live tour of our facilities, Q&A with our engineers and partner support team, presentations, amenities, and more.